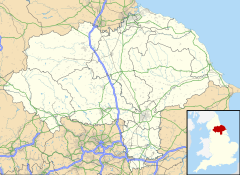 Yearby is a village in the borough of Redcar and Cleveland and the ceremonial county of North Yorkshire, England. It is located half a mile south of Kirkleatham on the B1269 road to Guisborough, close to Marske-by-the-Sea. Historically the village has been a part of the Kirkleatham civil parish. The name has changed through the centuries from Overby or Ureby in the 15th century to Earby and Verby in the 17th century. For much of its history, the lands comprising Yearby have followed the path of Kirkleatham, except between 1119 and 1635. After this date, it formed part of the Kirkleatham Estate owned by the Turner family until it was broken up in 1949. Until 1840, the village had a school. This is now a private dwelling, though a Grade II listed building. The village is within the Redcar Parliamentary constituency and the Dormanstown ward of Recar and Cleveland Borough Council. ^ William Page, ed. (1923). A History of the County of York North Riding: Volume 2. pp. 371–383. Retrieved 17 November 2016. ^ "Yearby conservation area appraisal" (PDF). Retrieved 18 December 2016. ^ Historic England. "Yearby Old School, Fishponds Road (1159826)". National Heritage List for England. Retrieved 18 December 2016. ^ "Local Elections". Redcar & Cleveland Borough Council. Retrieved 18 December 2016.